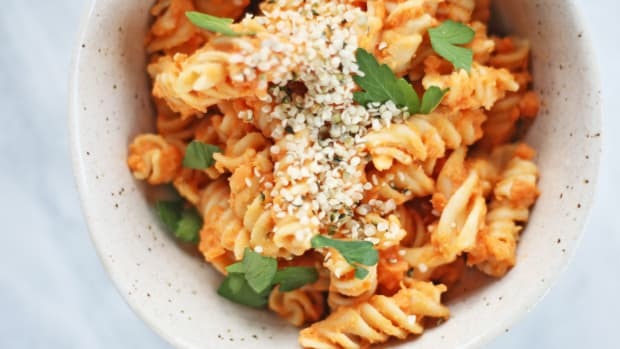 A warming, plant-based, protein-packed, one-pot dinner that can serve (and satisfy) a crowd almost sounds too good to be true. 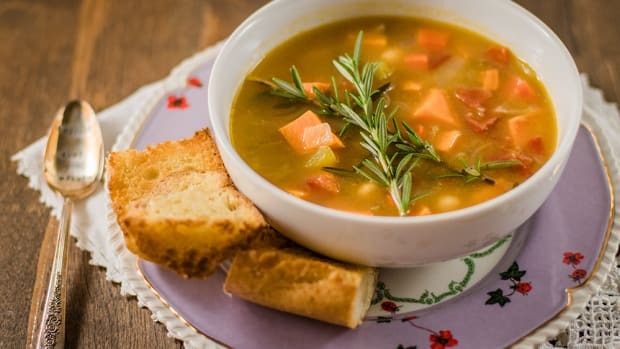 Thanks to the wonders of the unassuming crockpot, however, this simple vegetable and lentil soup is all that, and more. 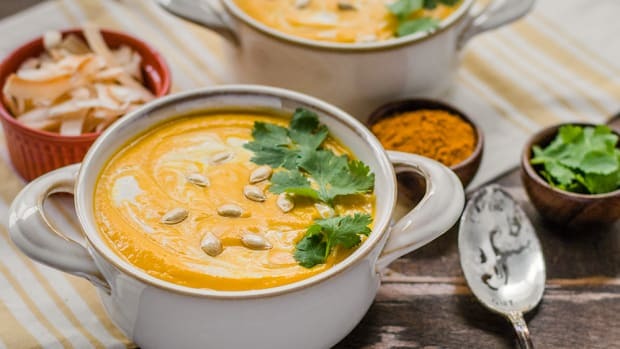 Often underestimated by other kitchen appliances (hello, high-speed blender), the crockpot is a kitchen staple – especially in the cold, dark days of winter. 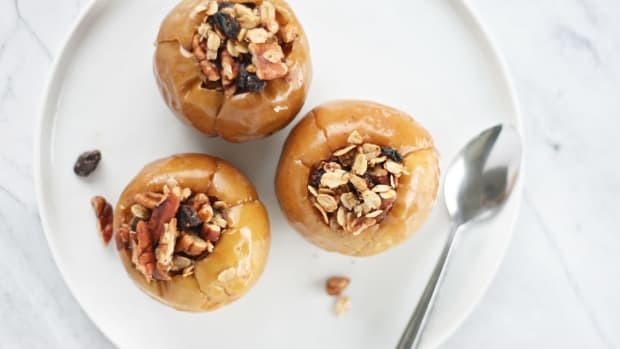 Simply prep your ingredients, throw them into the crockpot, and turn on – no stirring necessary. Your trusty crockpot can make anything from applesauce to overnight oatmeal, Indian food, chili and everything in between. 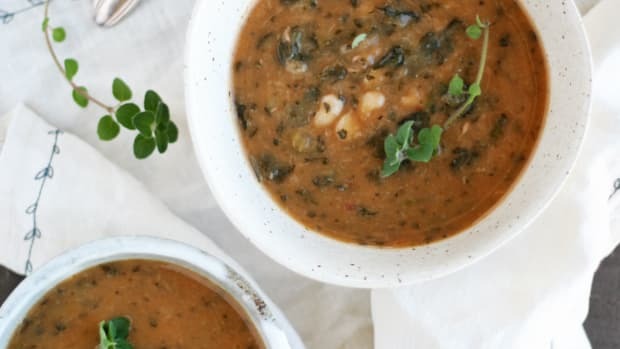 My favorite way to use the slow cooker is making hearty soups and stews, like this lentil crockpot soup filled with a variety of vegetables, garlic, and onions for flavor, fragrant herbs, and nutrient-dense Swiss chard. 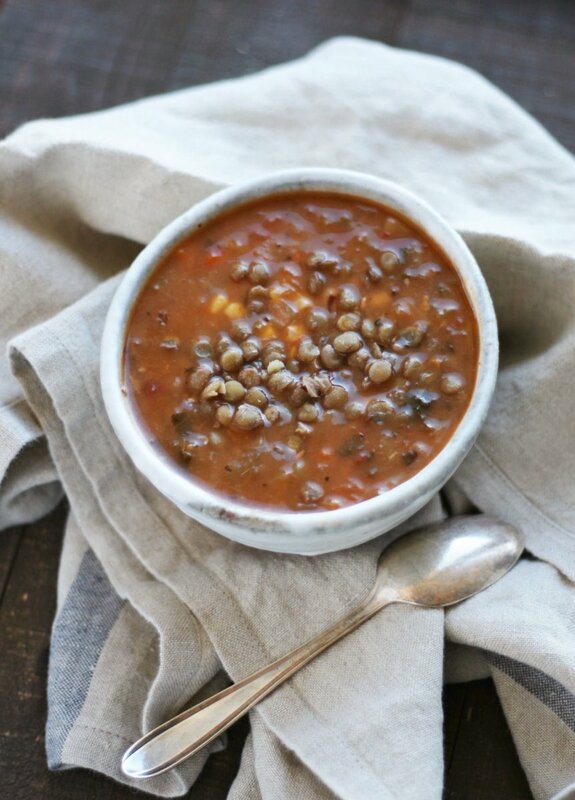 The lentils are the standout of the soup and make a filling yet nourishing meal with virtually no prep time. These colorful pulses (they range from yellow to green, black and red) work in a variety of cuisines and can take up different flavors depending on how they are prepared. Lentils are an inexpensive way to pack quality protein and nutrition into a dish. Technically a pulse (a legume), lentils are delicious in salads, tacos, grain dishes, vegan loafs, vegetable bakes, puréed to thicken soups, sauces, and stews, and they&apos;re even delectable when sprouted. Like other legumes, lentils are filled with fiber, protein, and a variety of nutrients which makes them incredibly beneficial for heart health. A 2011 study published in the Archives of Internal Medicine found that eating a variety of high fiber foods, such as lentils and other pulses, significantly helps to prevent the risk of heart disease. The study followed 10,000 American adults for 19 years and tracked their fiber intake along the way. 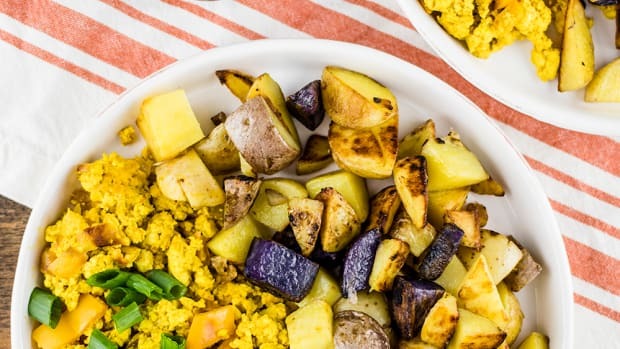 Those who ate the most fiber (21 grams per day) had 12 percent less coronary heart disease and 11 percent less cardiovascular disease, compared to those eating only five grams of fiber daily. Even better, those who ate water-soluble dietary fiber (found in oat bran, lentils, beans, barley, nuts, seeds, and certain fruits and vegetables) had a 15 percent reduction in the risk of coronary heart disease and a 10 percent risk reduction in cardiovascular disease. Along with heart-loving fiber, lentils also contain copper, phosphorus, iron, manganese, zinc, potassium, and other B vitamins. 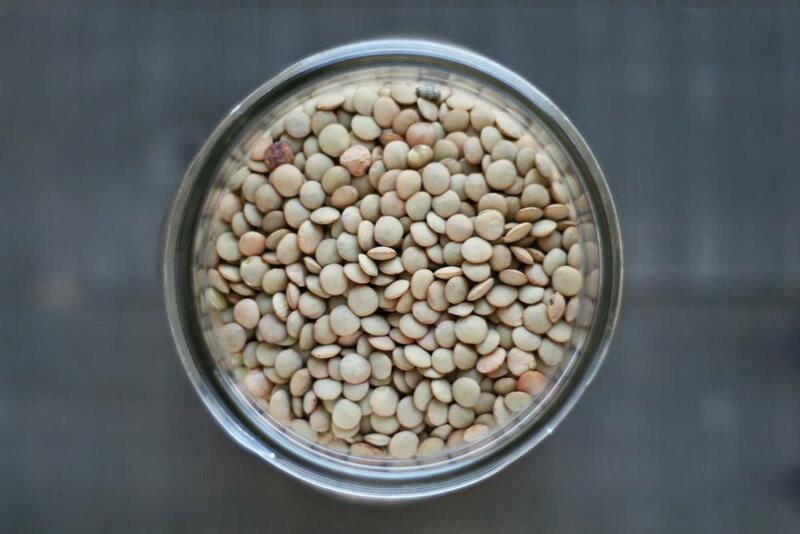 One cup of cooked lentils provides 330 percent of the recommended daily intake of molybdenum, a mineral that provides necessary cofactors to enzyme reactions in the body, including nervous system metabolism and mitochondrial function. 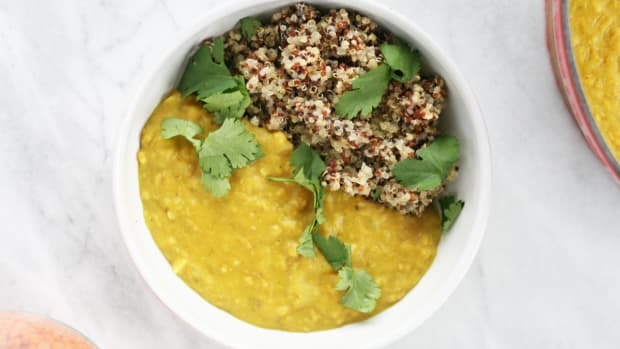 One cup of cooked lentils also provides 90 percent of the recommended daily intake of folate, a complex B vitamin crucial for nervous system function and cardiovascular health. Folate is especially imperative for pregnant women, as folate helps to prevent birth defects and promotes healthy birth weight, neural tube development, and heart formation. 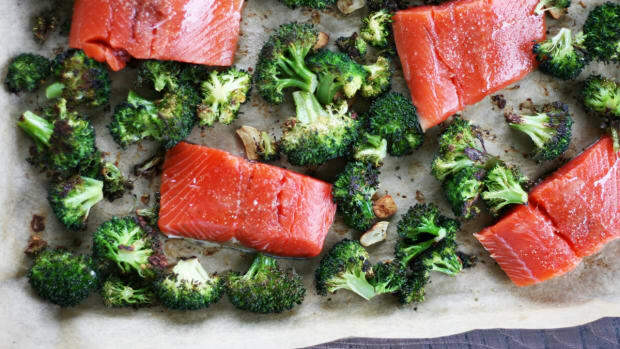 Folate is also necessary for vitamin B12 absorption, and a deficiency in this crucial vitamin can result in anemia and lowered immune function. 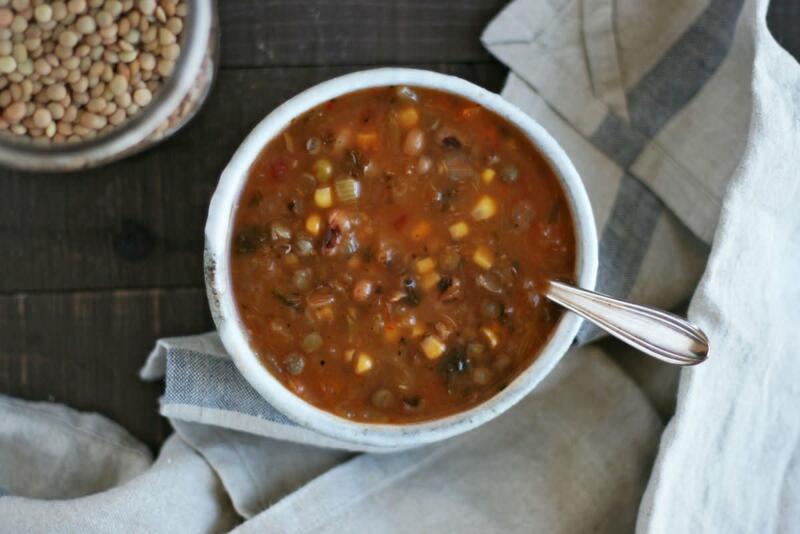 Along with nutrient-rich lentils, this lentil crockpot soup packs in vitamin K loaded Swiss chard, protein filled green peas, carrots for a boost of beta carotene, and flavorful herbs for an extra dose of antioxidants and powerful plant compounds. 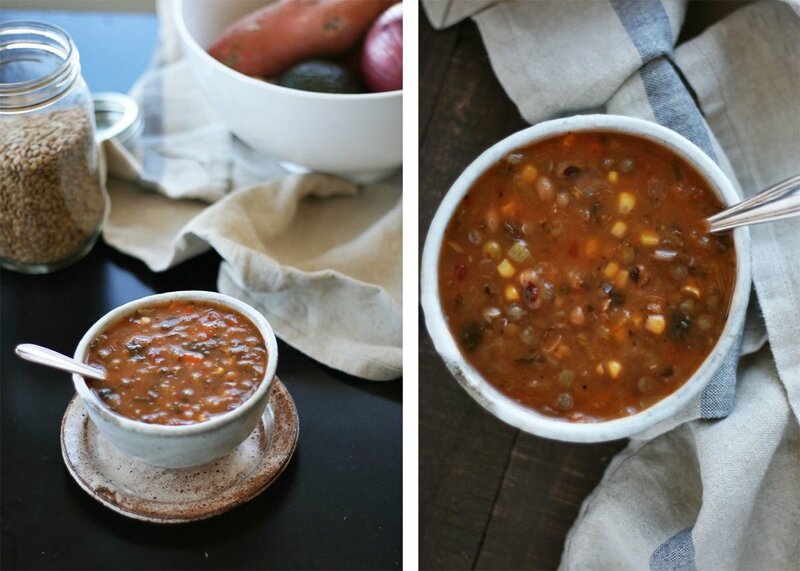 Lentils plus a variety of vegetables are a match in heart-healthy crockpot heaven. Place all lentil soup ingredients into crockpot, except for Swiss chard. Cover and cook on low for six hours. An hour before serving, stir in chopped Swiss chard leaves and season with extra sea salt and black pepper, to taste. Divide into bowls and devour. Enjoy!